Las Vegas Environmental Pros is proud to announce the new division to our company, asbestos testing. 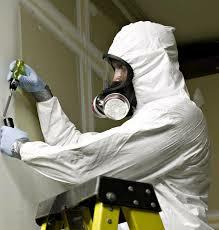 Asbestos testing is a tedious process and is governed by local and federal authorities such as OSHA and the EPA. Since properties built up to 1980 contained asbestos materials, we felt that it was the right move to incorporate asbestos testing into our company. Items that might have asbestos in them include property insulation, roof tiles and flashing, floor tiles, ceiling tiles, pipe adhesive, and even joint compounds that are used in the drywall process of building. Being that properties built up to 38 years ago can be affected, we definitely see the reason why we chose to incorporate asbestos testing into our business which has mostly been in asbestos removal, mold removal, and water damage cleanup. Asbestos testing is a process that needs to be done in a very specific way. Actually, there are several different ways to do asbestos testing. One common procedure is the (PCM) Phase Contrast Microscopy. This test is widely used when asbestos testing for particles that may be present in the air. Even air can have asbestos fibers so that is why it is important to do several different forms of asbestos testing. Most of us assume that asbestos is in insulation associated with older buildings that are getting prepared for demolition. That is actually just the tip of the iceberg. Asbestos is constantly growing and is naturally occurring minerals that are found all over the United States but especially concentrated in the Western States. That is just one more reason that we’ve added asbestos testing. The average person really won’t know if they are working or living in an environment where there can be exposed to asbestos. Being around asbestos for long periods of time can cause severe asbestos-related diseases, even cancers in the lung and chest lining. This is where the asbestos test for air really is important, as asbestos can only be harmful to humans when asbestos fibers are released into the air supply and they are then breathed in. Most older office and professional buildings are now finding it a mandatory order that they conduct an asbestos test by an accredited asbestos testing facility. We are proud to let you know that Las Vegas Environmental Pros has gone through all the specific asbestos testing training and have achieved all pertinent certificates regarding asbestos testing. You can rest assured that your asbestos test will be handled by the most professional and highly trained, certified team. Since the asbestos test is so carefully handled and passed to an authorized laboratory, costs of doing the asbestos test can be expensive. Even the smallest asbestos testing job can cost anywhere from $1500 - $3000. We are now capable of doing all asbestos testing procedures on the smallest job all the way up to larger commercial buildings. 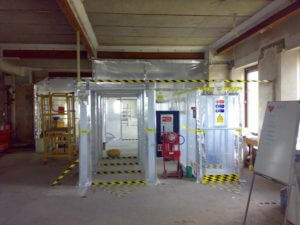 Asbestos testing is the final step that we incorporated into our environmental business. It is actually legal to remove asbestos on your private residence and we hear from time to time that a homeowner actually attempted to remove the asbestos without an asbestos test and not following the proper procedures. Las Vegas Environmental Pros highly recommends that you do not attempt to remove asbestos items on your own. 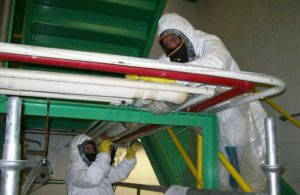 It is very easy for asbestos fibers to escape and get into the air during a “do it yourself” asbestos removal. If you find yourself in a remodel project and your property is older, it is imperative that you reach out to us so that we can perform our asbestos testing on your property before any demolition is done. Asbestos testing can take anywhere from 24 hours in a rushed order or the average time for asbestos test results are usually one week. You can see it is really worth the asbestos test to ensure your family is safe and free from asbestos contamination. We are always available so don’t hesitate and give us a call today to set up your asbestos test for your protection. Or, if you have further questions, you might visit our About Page or the form on our Contact Us Page to ask a question. Our professional staff will be happy to set up the asbestos test as soon as possible.